NEW: Bertram Ives kept a seaman's wooden box, now kept by his Grandson. Husband of Evelyn May Ives. Bertram Ives was born in February 1896 and at the age of just sixteen he joined the navy as a boy entrant. At eighteen, he signed on for twelve years. At the outbreak of WWI, Bertram was aboard the HMS King George V at Scapa flow. This ship was built at the Portsmouth Dockyard, laid down in January 1911, and completed in October 1912, just two years before the start of the war. In 1915 Bertram was posted to a gunnery school in Portsmouth. 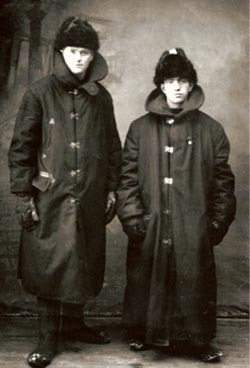 He was later assigned to one of the ships making up an expeditionary force to North Russia; the aim was to assist the White Russians in their struggle against the Bolsheviks during the Russian Civil War. The rather unusual photograph on the right shows the tallest and shortest seamen in clothing issued for the voyage. Bertram Ives was the tallest, and sent this postcard back home in March 1919. In 1920 Bertram married Eveyln May Pope at Kingston. During the following years, Bertram spent time in the Mediterranean and was away for up to two years at a time. Each time he returned home, he brought back presents as well as bunches of bananas, and oranges. It was a very happy time for his family, which between 1925 and 1933 expanded to include four children, Katherine, Felicity, Mavis and the youngest, Ian. 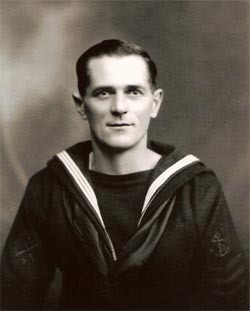 Bertram retired from the Navy in 1936 and worked as a postman in the village of Banstead, Surrey. He was recalled in 1939 and a Banstead local, Miss Edna Touzel remembers the Post Office being "emptied overnight" when the postmen were called up. 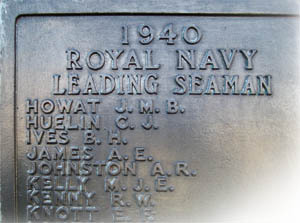 Betram Ives was posted to the Royal Naval Patrol Service aboard an armed Grimsby trawler, the St Achilleus. H.M. Trawler St. Achilleus had been requisitioned for Royal Navy service in August 1939, flying Pennant: FY 152. One trip it completed successfully was to Trondheim in Norway, to bring refugees back to England. Inevitably, the trawler was called on to evacuate troops from Dunkirk and on the 31st May 1940, on it's third crossing, it was sunk by a mine in the Dunkirk area. The reported date of death of Leading Seaman Bertram Ives is the following day. Edna Touzel, whose father Thomas, took over Ives' round remembers her dad coming home and saying "Ives has gone". This news left the post office staff stunned, as he was their first casualty. At that time, it was custom for postmen to record any monetary gifts given to them at Christmas, and all the postmen agreed that half their collections should go to the family of the postman whose round they had taken over. One of Bertram's daughter's, Felicity, got married five years later, in 1945. On her borrowed wedding dress, she added a section of Maltese lace brought back as a souvenir years earlier, by Bertram , from the small island in the middle of the Mediterranean. Memorial Reference: Panel 38, Column 1. Personal details and photographs kindly provided by Mrs Felicity Little, Betram's daughter. 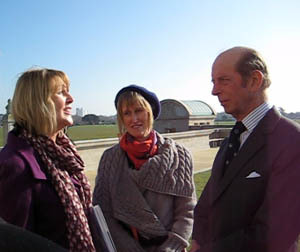 On Tuesday 19 February 2013, under a cloudless blue sky, HRH the Duke of Kent met Jane Chilton and Jill Skinner, granddaughters of Bertram Ives, a postman from Banstead village, who was killed at Dunkirk whilst on his third trip to rescue stranded allied soldiers. 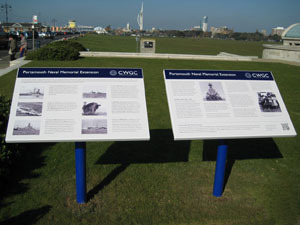 The event was arranged to unveil four Commonwealth War Graves Commission display panels erected at the Portsmouth Naval Memorial. The newly erected display panels. Try scanning the QR code for yourself! The Duke, who is the president of the Commonwealth War Graves Commission, was there to see the new panels, which combine new technology with the stories of some of those who died in the two world wars. A Quick Response (QR) code embedded in the panel can be scanned by a smartphone, downloading more stories directly to people's phones. The information panels have been put in place by the Commonwealth War Graves Commission and are among 500 the Commission is installing as part of a drive to provide more information for the public during the centenary of the First World War next year. The QR code at Portsmouth downloads several personal stories as well as detailing the great sacrifice the local community made in sending sailors to fight in both world wars. It is this section which includes Bertram Ives' story. 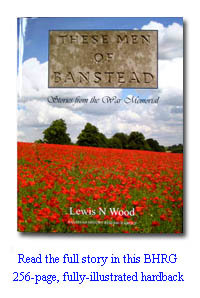 It can be read in more detail by scrolling up this page, and in yet more detail in BHRG's book titled THESE MEN OF BANSTEAD Stories from the War Memorial. 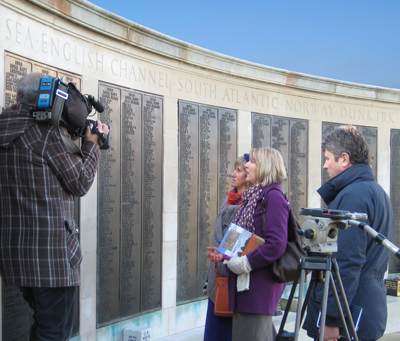 Jill and Jane (holding the book) view Leading Seaman Ives B H listed on Panel 38, and reflect on their grandfather's life, after speaking about him to the local TV news crew. BHRG member and author of the book, Lewis N Wood was contacted by a representative from the CWGC after he found Bertram's story on this website. Lewis in turn contacted four members of Bertram's family, two of whom were able to attend the event. Jane and Jill remain very proud of their grandfather and were delighted to receive the special invitation from the Commission. Both have also been to Banstead to remember their grandfather, who is one of the 119 Banstead men listed on the Village War Memorial.